In order to talk about some disorders in the body, you need to know the physiological norms, which are recognized by the specialists. Therefore, everything that is not included in the framework, is considered a pathology. Which arterial pressure can be considered normal? The adult norm is 120/80 mm Hg. the article all people's blood pressure constantly fluctuates. This is due to the different loads acting on the body, as well as excess weight, stress and many other reasons. The child's body may also experience changes in pressure. Only in addition to the reasons that are observed in adults, they are added such as the formation and growth of a child. In children, blood pressure slightly lower than in the adult, and that's fine. The younger the child, the lower its pressure. During the growth of the child increases and its pressure, the pressure rise should be smooth, upper and lower pressure should rise evenly. A sharp pressure jump in the young child occurs in the first year of life, then the pressure remains constant until about 6 years. After this age children comes the next stage of pressure. Blood pressure begins to rise, this should take into account that girls at this stage, the pressure is slightly lower than boys. The maximum value which can be as high blood pressure in children is 110/60 or 120/80 mm Hg.St. Cases where the pressure continues to grow, are a deviation from the norm. In such situations, you should consult a cardiologist. Currently, to obtain reliable pressure data, the child need not have special medical education. To make it possible for every mother, even at home. Now pharmacies are a wide variety of electronic blood pressure monitors. It is worth remembering that to measure the pressure only when the child is calm, it is desirable to lay it before bed. Only in this case it is possible to obtain reliable data. If your child's blood pressure often rises very little above the norm, do not panic. Have younger children most often manifest high blood pressure, not low. 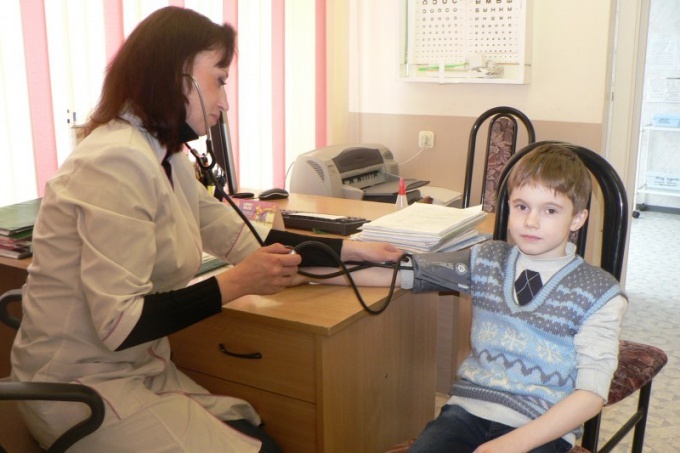 In order to have a child blood pressure is not sharply changed, it is necessary to normalize his daily routine, proper diet, mental and physical activity should correspond to its age. If there are any changes in the pressure, it is necessary to consult a specialist.